Our Vision: The sun is the most abundant resource that all humanity shares. Although it shines equally on all, some are in desperate need of harnessing it’s power to help provide basic necessities of life. For one seventh of the world’s population, or 1.1 billion people, the poorest of the poor live in a world without electricity. 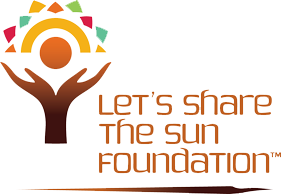 The Let’s Share the Sun Foundation will be the leading philanthropic organization focused on installing solar energy in the poorest parts of the world by combining basic solar installations with the training of local solar technicians and support from visiting delegations of solar experts, interested donors, and eager students. Why do we do it? We believe the sun, God’s most abundant resource, will fundamentally change our energy economy and improve the lives of ALL people throughout the world. How do we do it? We develop strong partnerships with trusted leaders in the host and donor communities. What do we do? We build high quality solar installations and provide comprehensive sustainable renewable energy solutions that improve the lives of the poor and empower local enterprise. 1. Apply a targeted, intelligent approach to our planning and execution. 2. Partner with Trusted Organizations with Strong Local Ties Who Will Help Us Assure Success in the Ongoing Maintenance of Installed Solar Systems . 3. Work with People We Trust in both Host and Donor Communities.